Fun and festive, our ground acts are a perfect way to add fun guest interaction and ambiance to your party, or to fill gaps in the event lineup! An act that stands well above all others! This classic entertainment option has a stilt walker wandering your event, greeting guests and handing out favors. A guest favorite! Heat up the party with a delightfully daring fire act! Our fire performers use poi, fans, staffs, palm torches, and clubs to safely spin fire and enthrall guests. We also offer fire breathing and fire eating to further astound and amaze! For a truly dazzling performance, try our spectacular luau fire production that's guaranteed to thrill! Polynesian-inspired dancers emerge bearing lit torches, with performers hula dancing in unison. Spectacular dances with various props including palm torches, poi, and fans follow; while hula dancers provide continuous dance entertainment in the background. Things heat up with a fantastic fire breathing finale! The show is approximately 20 minutes and can be tailored to any requested length. Alternate themed shows and costumes available upon request. Flexible acrobats dance in synchronization to perform impressive lifts, delicate counterbalances, and astounding poses. Watch as our elastic contortionists showcase their extreme flexibility in over splits and contorted poses! Fluttering, ethereal Dance Wings are a lovely way to add brightness and color to your event! Beautiful dancers whirl around your guests, dancing through the crowds and posing for photos. Fluttering veils flow through the air in a lively show of colors as a whirling dancer whips them around her body, keeping them in perpetual motion as she moves to the music! An energetic flow dancer performs gravity-defying feats, manipulating hoops in mesmerizing ways! Give your guests the ultimate VIP treatment by having them walk the red carpet into your event! As they enter, they’ll soon realize the carpet is formed from the train of an exquisite dress worn by the statuesque lady in red, who greets them warmly. Guests will want to pose for photos with her as they get stalked by your event "paparazzi.” This is one of the most stunning ways to welcome your guests to your event, and it’s sure to get them feeling like a celebrity! The length of the red carpet is adjustable in order to accommodate a multitude of entrances. 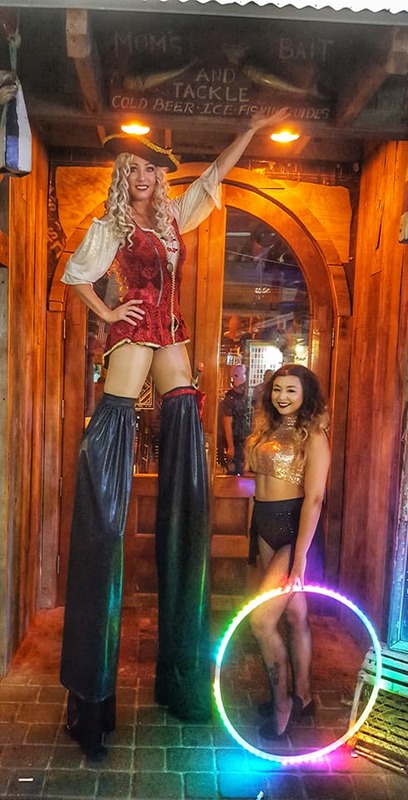 This act is customizable to accommodate many different themes, including a statuesque Lady Liberty for patriotic/Fourth of July events, a charming Southern Belle for the Kentucky Derby and antebellum parties, or an elegant Snow Queen for winter events and holiday parties. A gorgeous mermaid in an exquisite customized tail lounges in the pool or on a rock, luring in guests and posing for photos.